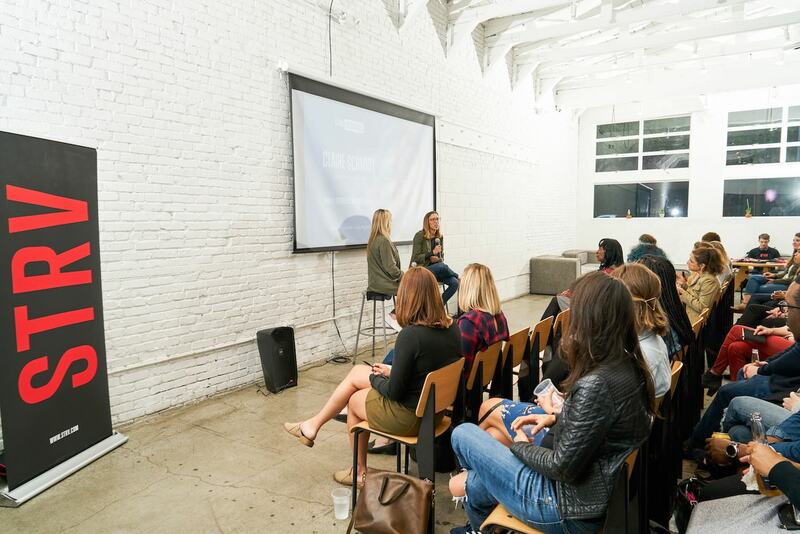 As part of our Women in Tech series, we hosted a special fireside chat with Claire Schmidt, who left her job as vice president at 20th Century Fox to found AllVoices, a site that gives employees a platform to anonymously report workplace harassment, bias and discrimination. The STRV-developed reporting tool launched earlier this year, coming on-line at the height of the #MeToo and #TimesUp movements, which saw a string of high-profile firings of top executives accused of sexual harassment, starting with film mogul Harvey Weinstein last fall. 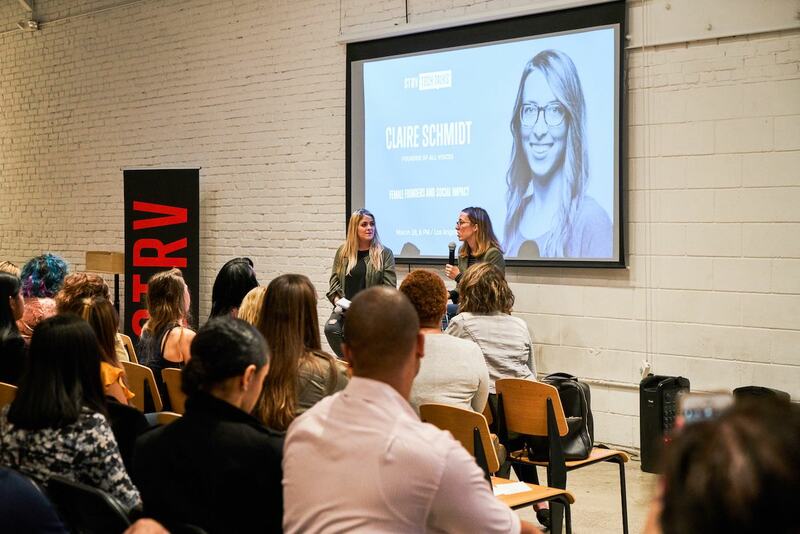 Claire sat down with STRV Account Executive Holly McKay at General Assembly Santa Monica to talk about what’s it’s like to be a female founder in a male-dominated industry. 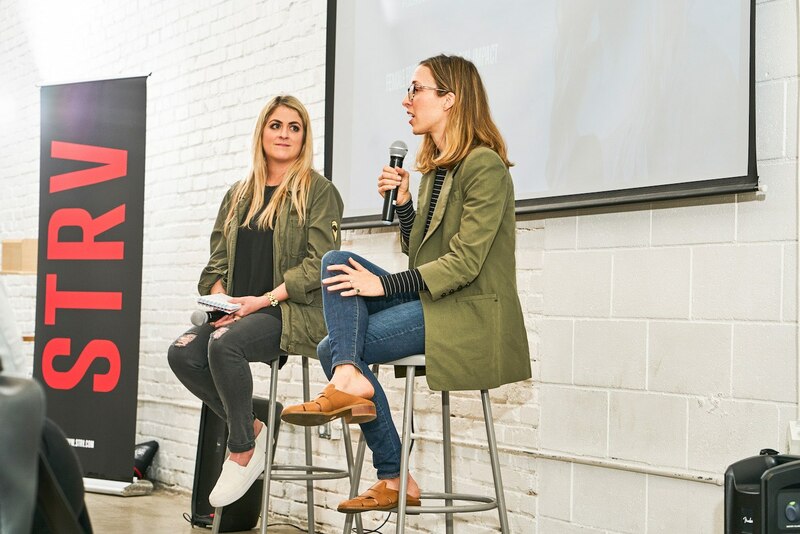 She shared fundraising tips and talked about how she secured a batch of top-notch advisors and investors — including Tinder co-founder and CEO Sean Rad and Susan Fowler, who blew the whistle (https://www.susanjfowler.com/blog/2017/2/19/reflecting-on-one-very-strange-year-at-uber) on Uber’s controversial workplace culture. I read the Susan Fowler blog post in February 2017. It was occupying part of my mind for months. Usually, you’ll read a story that is sad or difficult, and you’ll think about it and say, “that’s too bad,” and then push it away. And in this case, I just could not do that. I started talking to friends first about experiences that they’d had, and I realized throughout the process that these aren’t the type of things that people talk about. There is a stigma attached to it. This is a sensitive issue. I ended up having some really good conversations with people about what they experienced. This was pre-#MeToo. I think we are all pretty aware of these issues now, but at the time, I was sort of shocked by it. Then I started talking to people who were closer to this issue; people I know who worked in HR in the past or lawyers. I asked them what they thought about this issue and what could be done. That’s where the idea sort of started to gell. HOW DID #METOO AND THE HARVEY WEINSTEIN SCANDAL AFFECT WHAT YOU WERE DOING? Throughout last summer, we were kind of refining the idea, talking to different advisors and investors, and then when #MeToo and Harvey Weinstein happened, I just thought that it was so great that those people came forward and told their stories -- we absolutely need to create a culture were that is supported and encouraged -- and I believe that’s a huge part of how societal changes are made. I also thought about all the people who still haven’t spoken out and are not able to speak out today for whatever reason. This sort of reaffirmed my belief that there needs to be options for people about how to report on something like this when it happens to them, and this ability to anonymous report and share their story and have their voice heard without having to come forward personally struck me as really important. WHAT IS MOST REWARDING ABOUT BEING A FOUNDER? One of the most rewarding things about being a founder is that you have this idea. We’ve all had them. There’s this idea floating in the back of your mind, and maybe it goes away and maybe it doesn’t but to be able to bring it to life is incredibly rewarding. It makes all the difficult parts of being a founder really worth it. WHAT KIND OF CHALLENGES HAVE YOU FACED AS A FEMALE FOUNDER? My experiences have been pretty positive. I think that statistic of 2 percent of venture dollars going to female founders is just atrocious. That really has to shift. I think that, because of where we are right now with this movement, there are a lot of people who are actively trying to figure out how to change and how to improve on that statistic. 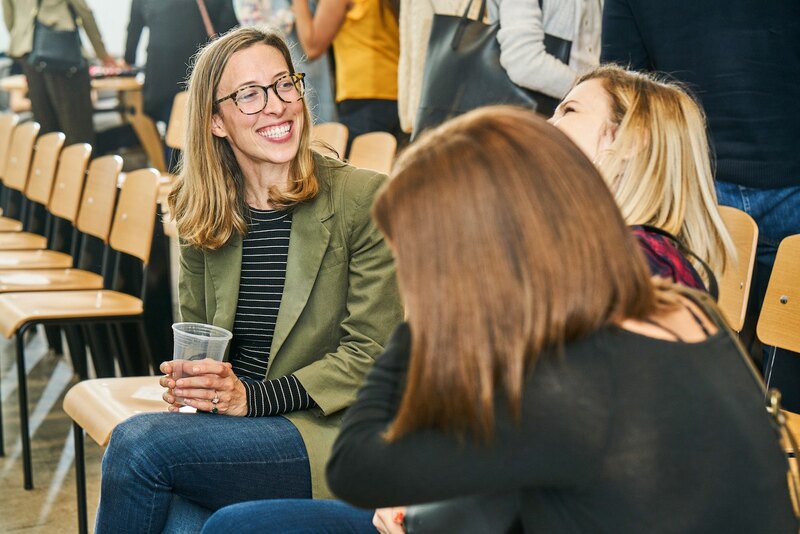 I’ve talked to a lot of people in just the past few months who are starting a female-focused fund or they’re creating an equity crowdfunding platform. I see people thinking about how can we shift this, because they realize how crazy that statistic is. TELL US ABOUT YOUR SUPPORT TEAM. I believe in collaboration, not competition. So we built out a really robust advisory board for that purpose. Now I have this network of experts who have equity in the company. It’s nice. You have all these people who are cheering you on. They are on your team. They are actually incentivized to make sure that you succeed. Our board is made up of all these people with very specific skills and perspectives, and I go to them when I have a question. My goal is to just make people feel safer in the workplace and to create more equal and more fair workplaces around the country and the world. So if we are actually helping employees and employees are coming to us and saying thank you for helping us resolve this issue or even just report it, I will feel that we've been successful.